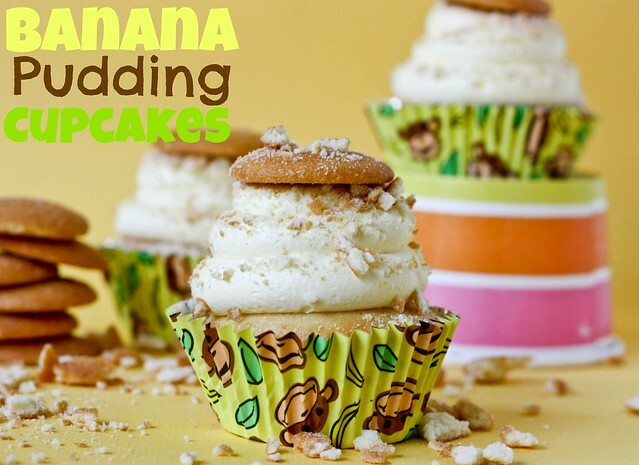 If you are a fan of Banana Pudding, you HAVE to try these Banana Pudding Cupcakes! I’m going to tell you right now that these cupcakes almost did not make it to the blog. It was a tragedy of epic proportions. In order for you to understand the severity of the situation, let me take you back a few days to Friday night. It was late, the boys were hanging out in the living room, and a certain pregnant lady was in her kitchen working on cupcakes for her website. Of course, she didn’t FEEL like working on cupcakes right then, but she was headed to Portland early Tuesday morning to meet a friend and go to Forks to be Twilight geeks, after which they would head to the BlogHer Food Conference in Seattle. So she needed to get a few recipes stowed away before her trip. After preparing the cupcakes, cleaning the kitchen, and putting them in the spare fridge in the garage (where they should be SAFE FOR A NIGHT), she collapsed in an exhausted heap because did I mention that she is pregnant. The next morning, after getting up and preparing blueberry muffins for the family (from a box, but still), she set up her backdrop and props and went to the refrigerator to retrieve the cupcakes. Most of the cupcakes were missing. There were only three left, not enough for the photo she had envisioned. Frantically her mind raced. And sadly…there was only one explanation. She called her husband, who wasn’t home. “I thought,” said the husband, “that those were the cupcakes you made for our Memorial Day cookout and they were old, so I gave them away”. “The ones I made for Memorial Day had canned frosting slapped on and sprinkles. These had frosting PIPED ON WITH COOKIES ON TOP OMGWHATWEREYOUTHINKING?!?! ?”, she calmly replied. Okay. She was not calm. “WHAT DID YOU THINK I WAS DOING ALL LAST NIGHT?! ?” she asked. It turned out, the husband isn’t always paying attention. Especially when shows involving swamp people or pawn shop owners is on. The husband was very sorry. But the pregnant wife was beyond reason. Heartburn was burning a hole in her chest, pre-trip preparations had her overwhelmed, and her husband was giving away her hard work all willy-nilly. Then he said she was taking things too far but the woman still disagrees about that. Then she made the photo work with three cupcakes, thanking fate that he hadn’t taken one more, and then she ate one and it was really good. Also, I may have forgotten to mention that she is pregnant. French Vanilla Cupcakes with a Vanilla Wafer bottom are filled with Banana Cream Pudding and topped with French Vanilla frosting and more Vanilla Wafers. You want one, don’t you? 1. Preheat oven to 350. Line 24 muffin cups with liners and set aside. 2. Place a vanilla wafer in the bottom of each cupcake liner. Prepare cupcake batter as called for on box instructions and fill liners 2/3 full. Bake for 15 - 20 minutes or until cake springs back when lightly touched. Place on baking racks to cool. 3. While cupcakes cool, prepare frosting: In a large bowl, whisk together milk, pudding, and powdered sugar until thick and smooth. Whisk in cream cheese until fully blended, then fold in Cool Whip. Place in the refrigerator for an hour to firm. 4. Prepare filling: In a medium bowl, whisk together cold milk and banana pudding mix until thick, about 2 minutes. Once cupcakes are cool, cut a circle from the middle using a small knife and fill with pudding. 5. In a large Ziploc bag, crush 2 dozen vanilla wafers. When frosting has firmed, pipe or frost on cupcakes and sprinkle with crushed cookies. Top with a whole cookie. Store uneaten cupcakes in the refrigerator. Of course, I will be documenting my dorky Twilight adventures on Instagram, so feel free to follow. Maybe I’ll even meet a real vampire. I bet vampire husbands don’t give unphotographed cupcakes away. Enjoy and have a happy Monday!! These sound sooo fabulous! Love it! Good thing you’ll be gone for a few days. Perhaps you won’t feel so stabby when you get back home. WOW!!! Now THAT is some layered love going on. Each and every layer sounds better than the next! Ah…husbands. Don’t cha wish you could be that oblivious and turn off your mamavision!? Love the monkeys! Looks like we will be making these soon. yes!!! i “taught” my cousin how to make regular banana pudding nd he thought i was a genius. wait til i show him this – he’ll think i’m martha stewart! I would happily have eaten both the Banana Pudding Cupcakes and the Blueberry Muffins. I think your husband is wonderful and should be forgiven. He is so proud of your genius I.Q. at baking he wants to share with everyone. Now. Enough about cupcakes. What happened at the doctor’s office? Is it a boy? a girl? twins? a cute vampire? a cuddly zombie? The suspense is killing me! Any update pictures of you and your baby bump and Jon David? goodness, do those look good…. Ok, the million dollar question here is…did the people he “gave” them away to, enjoy every last bite? Did they compliment their beauty, praise your creative ability, beg for more? Getting praise and satisfaction from others would have at least made me feel a little better about the situation. Had I have not received any of that though, the husband would never be served a homemade cupcake ever again!! EVER! Holy smokes! These look beyond fantastic! So glad there were 3 left! They look amazing. Have a wonderful trip this week! I just love your blog…makes me smile every time. Have recommended you to everyone I know. These banana pudding cupcakes sound delish. Ha!! I would have lost it on my husband also and I’m not even pregnant. This post was so funny and your cupcakes (despite the fact that several are missing) look fantastic! Men have no idea how hard it is to create cupcakes or be pregnant. They think it’s hard to focus on a tv show and pay on their ipad at the same time. Men cannot be reasoned with. I’m glad there were cupcakes leftover to take pictures with!! The cupcakes look great! I am moving to the Seattle area this summer and can’t wait for one of my girlfriends to come visit and make a trip to Forks! I don’t care that I am way too old for that crowd, it’s going to happen! Leave it to husbands! I think I have mine trained to always ask before digging into thing, but you never know! Picture looks great, and the cupcakes look better! If these cupcakes didn’t make it to the blog, I would have cried. 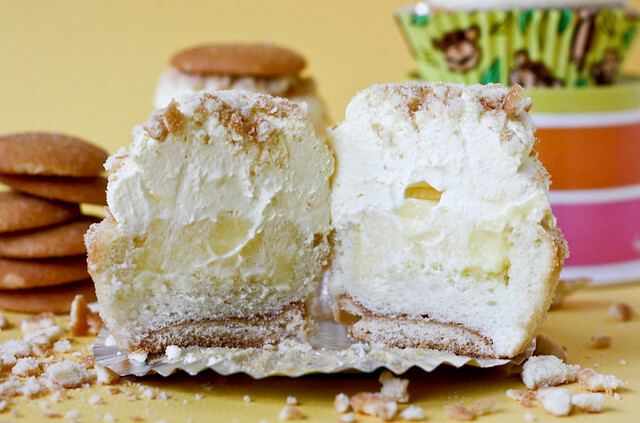 I have been dreaming about banana pudding in a cupcake version. I want to call in sick to work today and make these cupcakes instead! That frosting sounds perfect! Good thing the husband was not within reach! Oh my! I swear your husband must be my husband’s twin. What was he thinking? Once upon a time I made a cake to take to surprise our daughter on her first birthday away at college. I slaved away making the cake and frosting from scratch before heading to bed one night while he was watching TV in the living room. I left the cake to cool so I could frost it in the morning and then take it on the plane with me. I get up bright and early the next morning only to find —- a large piece missing! Ignoring the large shriek emanating from the kitchen at 6:00 a.m., all he can say when I demand to know what he was thinking is “Oh, was that the cake you made to take?” Oof! Husbands! Glad at least some of your cupcakes survived as well as your husband. These cupcakes are amazing! I love how much depth they have. Okay, your photo is amazing, even with only three cupcakes! =) And I LOVE the monkey cupcake liners along with the banana cupcakes–my 4-year old would totally get a kick out of these. You are so funny and your cupcakes look wonderfully decadent. I do believe there could never be a better cupcake after seeing this one. I want a dozen and I love the cute cupcake liners! I am also wondering who he gave the cupcakes to so early….if they liked them and why was he skulking about in YOUR extra fridge!!?? They look divine and I will try them soon!!! Okay. So. He was moving his tools and stuff from the garage of our old house with a coworker/friend and they stopped by our NEW house to drop a few things off. I guess the guy opened the fridge for a drink, saw the cupcakes, and asked if he could have one. My husband didn’t even look at the cupcakes, just ASSUMED they were old and left from Memorial Day EVEN THOUGH I had been up late making cupcakes the night before. So…he said, “Sure, take as many as you want, they are old anyways”. SO the guy took eleventy zillion of them. WHO GIVES AWAY CUPCAKES WITHOUT EVEN LOOKING AT THEM?!?!?!?! Your husband’s never ever, ever going to do that again, is he? I mean, why risk the wrath of a pregnant woman? It can be frightening. I’m so sad that I won’t be at BlogHer Food this year to rub your pregnant belly and see you deploy fart machines behind people’s backs. I’m sending you a hug anyways. Where did you get these cupcake liners? They are absolutely adorable! I looked online but couldn’t really find anything. I love banana pudding! These sound like perfection!! OMG! Thank you for making these JUST FOR ME. These sound sooooo good! I love banana pudding and these cupcakes are great new twist. I want to try a banana pudding based cheesecake sometime. OK….so, these look AMAZING!!! Total comfort food wrapped up in a cupcake. That cupcake cut-through is killing me…I want to sink my teeth into one so badly!! This was one of my favorite pie flavors as a kid – brings back great memories. Oh my goodness, what lucky people got those cupcakes. I wish I still lived in Portland so I could go be a Twilight Geek. I love the books enough to read them twice. I only loved the first movie, the others are just OK for me. Those three cupcakes made mouth watering photo’s. Our silly old husbands make mistakes like that from time to time…it is tuff and being pregnant don’t make it easier. I hope your trip is a blast! These cupcakes are absolutely delicious! I was looking for a great cupcake recipe that wasn’t boring. My boyfriend’s birthday is today, and I made these for him. They tasted so good, that I almost didn’t want to tell him I made them. Great recipe! I can’t WAIT to make these! One question first: do they sell “whipped” cream cheese, or do you buy regular cream cheese and whip it yourself? Or does it matter? I seem to recall seeing some whipped cream cheese once but I want to make sure before I go to the store. Sooo…I made these this weekend and they’re seriously amazing. I’m about to blog about them (giving you credit, obvi). Everyone loved them and I’m glad to finally have a banana pudding cupcake recipe that doesn’t taste like banana Laffy Taffys! Yay!! I’m so glad you liked them!! Oh My Gosh! These look sooo yummy! I loved Banana Pudding and can’t wait to try this receipe out. Omg you are adorable lol, and those cupcakes look so delicious I cant wait to try and make those. Love the story… And your honesty and humor when things go slightly awry in the kitchen. Thank you, too, for the do-able recipes. You my dear, are hilarious :) I’m so glad to be rid of my tv-zombie-unblogged-food-donator/eater ! These look perfect for kids, my eldest turns 7 this weekend (yikes!). Thanks for the idea!!! My girlfriend posted these on facebook… so of COURSE I HAD to have the link… and now I’ve spent a relaxing night going through all 53 pages of cupcakes and pinned at LEAST 30!!! These included! I Can’t wait to try all the yummy cakes!!! YUMMY! I made these for my son’s 1st birthday party. He LOVED them! He doesn’t like sweets and had tried chocolate cake and white cake previously and didn’t care for them. He loves bananas so I hoped he would like these….and he did! I did add some mashed banana to the cupcake but other than that I made them exactly per the recipe. Just saying, I think your blog is awesome….and you are even more awesome. You have an amazing sense of humor, and I literally LOL when I read your blog. Whenever I am having a bad day, I hop on over to your blog and I always feel better. What tip did you use to pipe these? I have made these cupcakes for two different places where I’ve worked now. And people literally lose their minds over these! I’ve tried several other recipes you have, and these are still my favorite. Thanks for posting! Would these cupcakes work in mini-cupcake form? YES, I want 1 or maybe 2 or 3….. Gotta love that man…..not sure WHY, but love him just the same! My family and friends love these. I’ve been making them on request often since stumbling across this delicious recipe. Thanks for sharing!